In the language of quantum mechanics a pure physical state is represented by a state vector in Hilbert space. From this state one can calculate the probability of finding the particle at a specific place with a certain spin. Furthermore, the state vector carries phase information, property that cannot be measured in an intensity measurement. However, a phase difference between states vectors is a physical quantity, giving rise to the phenomenon of interference. Phase accumulation is, at first sight, a consequence of dynamics of the state evolutions. In addition to and independent of this dynamical phase Sir Micheael V. Berry discovered in the beginning of the eighties of the last century a phase due to the geometrical (or topological) origin of the state evolution. The peculiarity of Berry’s geometric phase phase lies in the fact that it does not depend on the dynamics of the system, but purely on the evolution path of the state in parameter space. 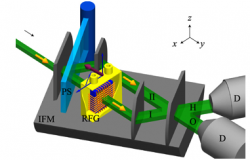 The effect of spin–rotation coupling is measured for the first time with neutrons. 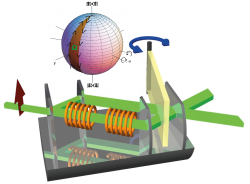 The coupling of spin with the angular velocity of a rotating spin turner can be observed as a phase shift in neutron interferometry and polarimetry. After the neutron’s spin is rotated by through a rotating magnetic field, different phase shifts are induced for ‘up’ and ‘down’ spin eigenstates. This phase difference results in the rotation of the neutron’s spin-vector, which turns out to depend solely on the frequency of the rotation of the magnetic field. The experimental results agree well with the solutions acquired by the Pauli–Schrödinger equation. 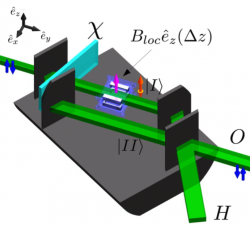 We have developed a new method for coherent Larmor spin-rotation control using topology optimized 3D printed magnets for applications in neutron interferometer experiments, where the rotation axis is parallel to the outer guide field. The magnetic action can be adjusted linearly by varying the distance between the magnets. We have showed that spin-rotation angles of more than 4π are possible, depending on the initial magnetization strength. The advantages of this new method are that unwanted inductances are avoided, and that no heat is dissipated by current carrying wires, which prevents a reduction in interferometric contrast due to temperature gradients or would make water cooling necessary. The influence of the geometric phase on a Bell measurement expressed in terms of the Clauser-Horne-Shimony-Holt (CHSH) inequality, is observed for a spin-path-entangled neutron state in an interferometric setup. It is experimentally demonstrated that the effect of geometric phase can be balanced by a change in Bell angles. The geometric phase is acquired during a time-dependent interaction with a radiofrequency field. Two schemes, polar and azimuthal adjustment of the Bell angles, are realized and analyzed in detail.